With the DualWingGenerator, Festo has developed an extraordinary technology platform as part of the Bionic Learning Network. In contrast to conventional small wind power stations, the system uses two pairs of opposing wings instead of rotor blades to generate power. The system’s principle consists of reversing the natural wing-beating principle: birds generate the necessary power to move forwards in the air by flapping their wings. 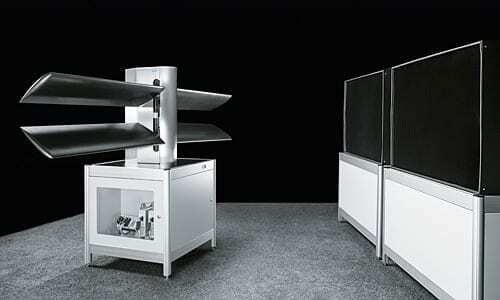 A stationary system like the DualWingGenerator, on the other hand, can take the kinetic energy from the flow of air. The wings’ linear lifting movement is converted here into a rotary movement. An integrated electric motor turns the energy produced into electricity. The DualWingGenerator is self-optimising and can adapt itself to different wind conditions. In terms of its efficiency, it is by no means inferior to conventional small wind power stations and features amazing benefits even at low wind speeds: in the range between 4 and 8 m/s, the system has a very high, scientifically proven effectiveness level. March 28, 2019 - Why attend HANNOVER MESSE 2019: Festo Aerospace Manufacturing and DesignFesto will showcase several product innovations for factory and process automation during the trade fair. April 12, 2019 - Festo solutions boost OEM productivity Today's Medical DevelopmentsFesto displays cutting edge electric and pneumatic motion automation solutions at Automate 2019, April 8-11, McCormick Place in Chicago, Booth #8151.